The Trodden Path (Episode 2): A Glimpse At the Lives of the Illustrious Scholars and Saints of the 20th and 21st Century. Do you have any concern about Crescent Radio that you want to share with us? Have you heard something on air that you’re not happy with? If so please get in touch and let us know so we can do something about it. 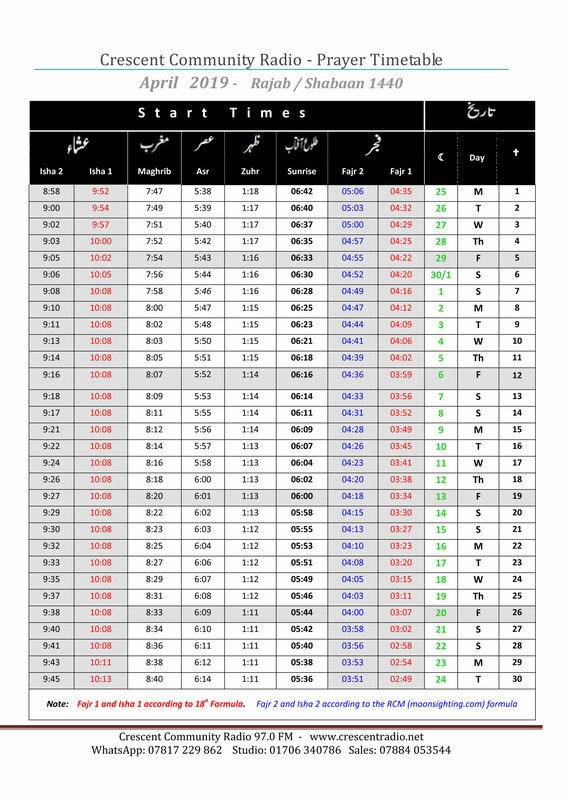 Can you please update the salah times please its well into february now! You must be more efficient, also where is the Alex Jones feed? Your also playing music in the month of Moharam, really?! Please get some chat shows in the evening there was some young brothers on there who dont seem to be in the drive time. You must do more active radio presentation at the drive times morning at afternoon, when people are driving home, not mindless meaningless songs in peoples mother tongues, most youngsters and ashamedly myself struggle to understand the punjabi, bangledeshi and Urdu but I dont mind that as it helps improve my skills. I did do the Mpackuk show a year ago you need something current and relavant. Copyright © 2019 Crescent Community Radio 97FM. All rights reserved.